Two sets of word labels. One set to match teen numerals (Exercise 5.D) and one set to match tens numerals (Exercise 9.E). Exercise 1. - The student organizes the labels in sequential order and forms the corresponding numerals with the Seguin Boards. Exercise 2 - Two students work together with one set of labels and one set of Seguin Boards. 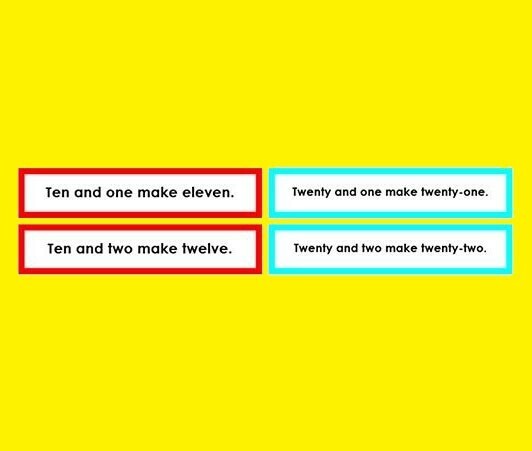 One student reads one label at random and the other student forms the corresponding numeral. Continue through until the whole sequence of numerals is reconstructed on the boards. Then the students switch turns at reading and forming the numerals.